A long-distance move is always a daunting and time-consuming task. However, it can become even more difficult and stressful if you own a piano that you do not want to leave behind. The problem is that a piano is one of the most difficult items to move, to say nothing of its international transportation. This job requires special knowledge, skills, and certainly equipment. 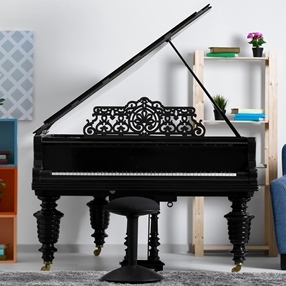 Moreover, due to the piano’s size, weight, and unique structure, you simply cannot move it on your own without damaging this delicate musical instrument or injuring yourself. The only way out is to hire experienced movers specializing in shipping pianos overseas. Fine Art Shippers is a professional fine art shipping company in NYC, providing a variety of artwork and antique moving services both nationally and internationally. Shipping pianos is one of our specializations, and we are especially proud to offer comprehensive piano moving solutions tailored to the client’s unique needs. Moreover, our specialist team of piano shippers can do this challenging job for you at a reasonable price so that you are sure to stay within your budget. If you are considering taking your piano abroad, it is of utmost importance to ensure that your beloved musical instrument is properly packed. Keep in mind that quilted pads and towels are not enough to protect a delicate piano in transit when it comes to a long-distance move. In addition to standard packing techniques used for shipping pianos, international transportation also requires a piano to be crated. The good news is that Fine Art Shippers can design and build a high-quality wooden crate with a custom interior for literally any object, including grand pianos of any size and weight. Only when a piano is properly packed and crated, it is ready to be transported to another country. In general, shipping pianos is difficult, but it can be made much easier with proper preparation and an experienced team of piano shippers at hand. At Fine Art Shippers, we offer all possible piano shipping services, from local moving to international transportation, so you can contact us for any help you need. We will not only deliver your piano to its destination safe and sound but also provide you with the best moving experience ever!